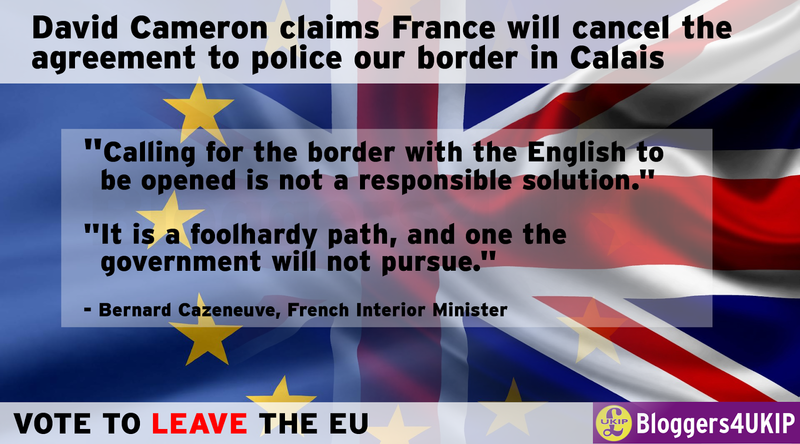 Project Fear is busy telling people that if we leave the EU the French will cancel the agreement that allows UK border officials to enforce border controls in France. The Sangatte Protocol was signed in 1991 and allowed for juxtaposed border controls in France and the UK. This was a bilateral treaty signed by the French and British governments, it has nothing to do with our membership of the EU. The Vienna Convention on the Law of Treaties (which both France and the UK signed) says that a treaty can only be terminated in accordance with the terms of the treaty or by mutual consent. There is nothing in the Sangatte Protocol that allows either France or the UK to terminate the treaty unilaterally so under international treaty law both France and the UK must agree to its termination. The EU remainers portray the agreement with France as a one-sided affair that means we can police our borders in France and only we get any benefit but that's not the case. Under this agreement, the French border is moved to Dover and Folkestone where French officials police not only their own borders but the gateway to the Schengen zone from the UK. It's far from one-sided and the benefits of the agreement are felt across the 26 Schengen countries (4 of which aren't even in the EU). There is no doubt that we get a lot of benefit from being able to police our frontier in France but we shouldn't downplay the benefit to France and the other 25 Schengen countries. If France were to illegally terminate the bilateral treaty that allows this arrangement as a punitive measure for leaving the EU then what would actually change? France would still have an obligation to provide border security and passport and visa controls on the French side of the border, regardless of whether the frontier was in France or England. The border would still be enforced but illegal immigrants who made it through French border controls would end up being caught and processed on UK soil rather than French. It would make the UK responsible for their deportation but outside of the EU we would have our own immigration laws under which to deport them without the EU courts thwarting every attempt at removing illegal immigrants as we are entitled to do under international law with those not claiming asylum in the first safe country they arrive in. While we're hobbled by the EU courts and EU laws the juxtaposition of borders has a lot of value but without that straightjacket its value is significantly diminished.